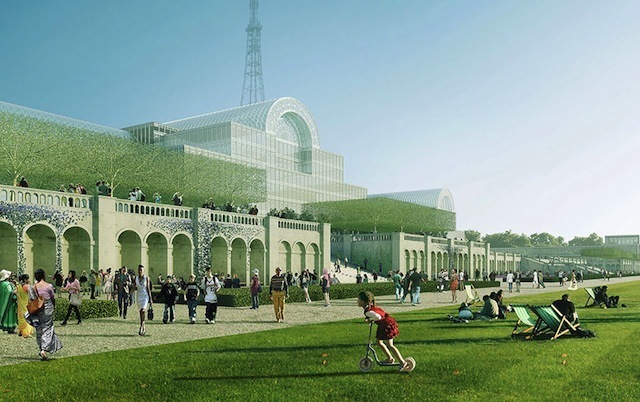 A £500 million proposal to rebuild the Crystal Palace moved a step closer today, as the Chinese ZhongRong Group revealed detailed plans of the scheme, first dangled earlier this year. The investment group wants to build a full-scale replica of the building in Crystal Palace Park, which would itself be spruced up. The original structure was built in 1851 to house the Great Exhibition in Hyde Park. It was subsequently flat-packed and rebuilt in Sydenham on an even grander scale. The vast greenhouse, which eventually burned down in 1936, had such an impact on its new location that the area has ever since been known as Crystal Palace. Frequent calls and proposals to rebuild the structure have come to nought, but this latest project appears to have significant momentum, backing and finance. The plans are supported by the mayor and leader of Bromley Council, which oversees the site, and have been welcomed by Mayor of London Boris Johnson. The scheme would incorporate the existing Italian-style terraces of the original building. The wider park would also be relandscaped to match the Victorian original, and other period features including the ornate underpass would be rehabilitated. Somewhat hilariously, the plans also call for a 'dinosaur interpretation centre' near the park's famous prehistoric-animal models (most of which aren't dinosaurs, incidentally). But what would the developers put inside the great glass structure? The plans are still a bit vague on this. The press statement mentions "free public and world-leading international exhibitions and events". (Note to self: remember that 'free' promise, in years to come.) The scheme also include "a hotel and conference facilities, studios, galleries and other commercial space". Boris Johnson said: "This is a vision that could not only see a world-class landmark building reinstated, of the quality of the original, but the restoration of the entire surrounding park, bringing jobs and growth. Together with Bromley council and taking account of the views of local people and leading experts, we'll now be working closely with ZhongRong Group to progress these plans in more detail." As you'd expect of any area-changing project, though, not everybody is giddy with anticipation. Green Assembly Member Darren Johnson notes that Sydenham is not the sylvan wilderness of yore. “While I’m sure many people would love to see the Crystal Palace raised from the ashes, this precious parkland isn’t the right place for it. When the palace was moved there in the 1850s the newly laid out park was near countryside, but today it’s an urban park with a lot of space already taken up by the national sports centre, car parks, roads and the caravan site." Most local groups like Friends of CP Subway (@cpsubway) are themselves taking a neutral 'wait and see position', but many of their Twitter followers appear against the scheme. Many are concerned that such a radical proposal is being forced on the neighbourhood top-down, with a lack of community input and drive. Others fear the grand project will simply turn into a pseudo-Westfield full of big brands and chain coffee shops. 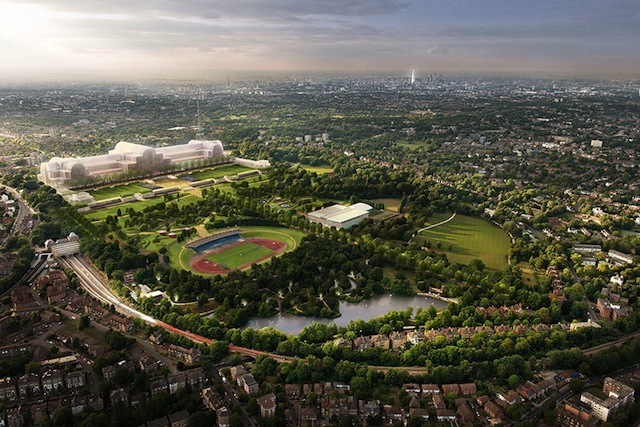 Indeed, the proposal is surely the most divisive to hit London since the Olympic bid, and it can be spun in many ways. On the one hand, south London could receive a staggering new landmark that would capture the imagination and promote interest in the site's history, while creating jobs and boosting the local economy. On the other, a much-cherished green space is being radically altered by an overseas business consortium who are seeking profit over cultural worth. Expect a giant hothouse of debate. The business consortium promises a year of consultation with local businesses and residents, and a full transport assessment to gauge the impact on local facilities. A steering group, headed by the Mayor of London, will guide the plans through further development. We, like many others, will be monitoring these consultations closely. Detailed plans, drawn up with engineering firm Arup, will then be formally submitted in 2014 and work could start towards the end of 2015.